Microsoft was pretty thorough with it’s included apps in Windows 10. For pretty much every type of file you can think of, Microsoft has an app for that included with Windows 10, except of course for your productivity files such as Word documents and the like. For that, you have to pay more. But, if you are like many of us, there’s a good chance you may not be a fan of the apps included in Windows, or you may just have one you prefer over what’s included in Windows 10. For instance, you may want to use iTunes with your iPhone to control your music library and not Groove Music, or you may have Photoshop installed from Adobe so you don’t want to worry about the basic photo viewing apps included with Windows 10. Whatever the reason, you aren’t forced to use these apps. 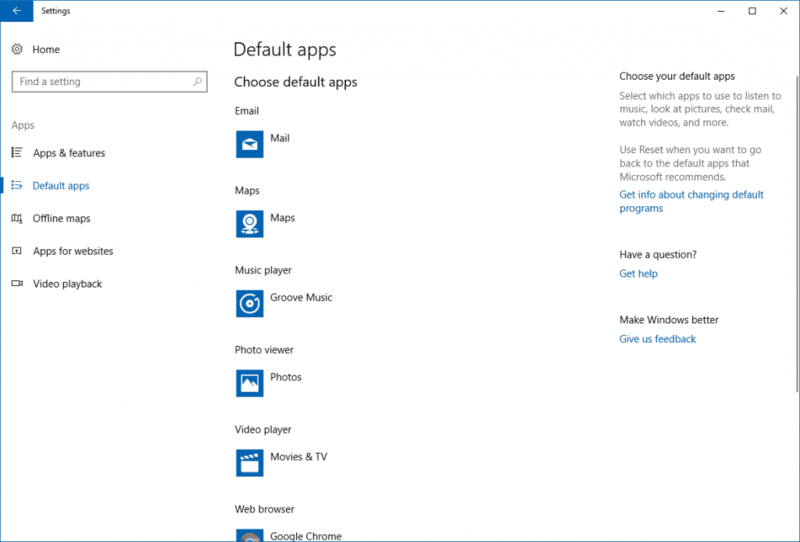 You can easily change your default apps in Windows 10 with just a few clicks. Today, I will walk you through, step by step, how to change your default apps in Windows 10 so you can use the apps you choose, and not the apps Microsoft tries to convince you to use on your laptop. 1. Click on Start (Windows logo in the bottom left-hand corner of your screen). 2. Click on Settings (Cog icon). 3. Go to Apps & Features > Default Apps. 4. Choose a Category and then select the app you want to use as your default. 5. If you need to specify a specific file type app, such as PDF files, then click on Default apps by file type towards the bottom of the page. 6. Scroll through all the available file types, select it and choose the default app you want to use. That’s all there is to it. 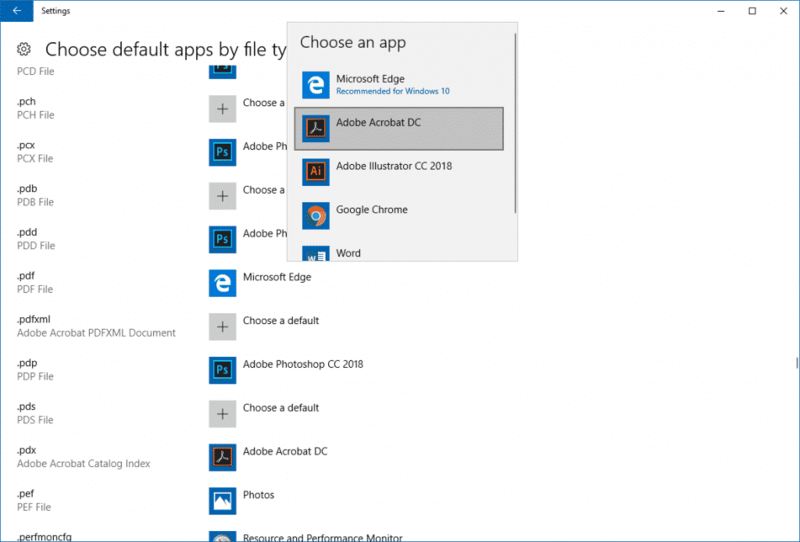 In just a few clicks, you can customize what apps you use for each type of file or even for each specific file type available on your computer. This means you won’t be stuck using Edge as your browser or any other Microsoft app, for that matter. After awhile, you may have changed your default apps so many times you aren’t even sure what you are using anymore. If this happens, you can reset your default apps and start from scratch. Remember, resetting your default apps will convert your defaults back to the very first day you booted up your laptop for the first time, so make sure it is what you want to do. 4. Scroll down to the bottom of the window. 5. Click the Reset button. Once you click this button, all your default app settings will revert to the Windows default state. This means that Groove Music will again be your music player, the Photos app will open your picture files, and Edge will be your default browser. Now you can return to the default apps section and customize them again, if need be. Who knows, you may want to stick with the default options. The choice is up to you. While I do enjoy using Windows 10, I don’t enjoy all the different Windows 10 default apps. I can’t say I’m a huge fan of Groove Music, for instance, and while Edge is growing on me, I’m still not ready to make the switch from Chrome. But that’s not all. Edge has a nasty habit of making itself not only your default browser, but also your default viewer for PDF files. I would recommend downloading Adobe Reader and installing it on your system. Then, visit your default apps and change the file associations of .pdf and .pdx to Adobe Reader. In my experience, some PDF files just don’t display right and some features don’t work in Edge. For your best experience, installing a legit PDF application and using the browser plugins instead of the default Edge features will work much better. The great thing about these settings is your ability to customize your experience. While Microsoft really wants you to use their apps, they don’t mind if you don’t. In fact, most of the third party apps work very well in Windows, and in some cases even better than the apps Microsoft has included. But your opinion may vary. That’s what’s so great about Windows 10. Despite many changes, Microsoft has still left it open enough for us to use it much as we have with past versions of Windows, so don’t think you are stuck using apps that Microsoft included on Windows. Of course, this will depend on what version of Windows 10 you use. But most of us have either Windows 10 Home or Pro, so you shouldn’t have any trouble customizing the apps you use on your laptop. While Windows 10 may have gotten off to a bit of a rough start, it’s truly starting to find its ground today, and Microsoft continues to improve the experience with each new release. Despite the improvements, in many cases third party apps are just better options for many of us and what we do. By changing your default apps in Windows 10 that your laptop runs, you can customize what apps you use for your day to day activities. So whether it’s your email, pdf files or even your browser, it’s up to you what you use. 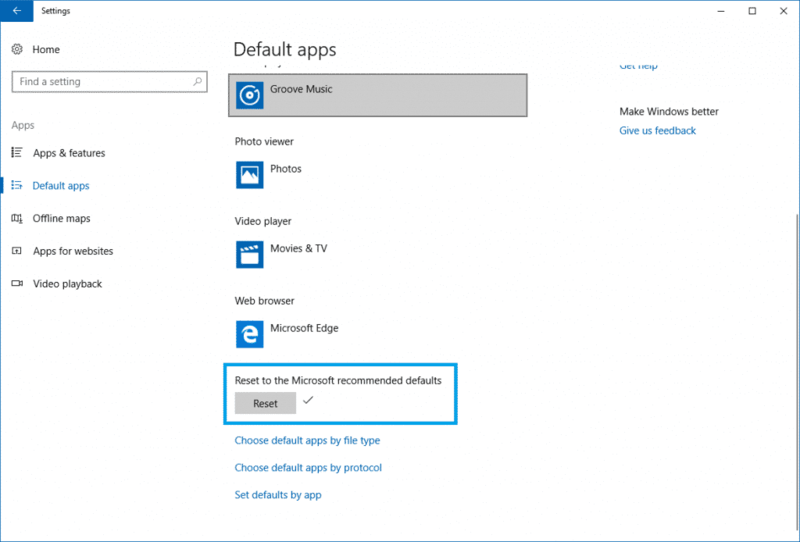 What apps have you chosen as your defaults in Windows 10? Tell me what apps you prefer to use on your Windows 10 laptop in the comments below. Do you use Edge or another browser? Tell me what you prefer to use on your Windows laptop.